Please use code DELORIS to save 20% off your order. 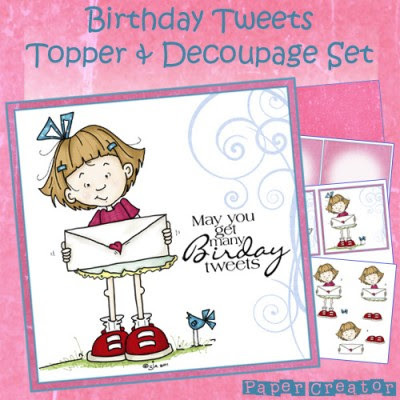 This little cutie is from the Birthday Tweets Topper And Decoupage Set at the Paper Creator store. (Please note I only used the decoupage page from the kit and I reduced the size of the images before printing so they fit the die cut frame.) I hand cut all the images and layered them on top of each other following the numbers on the decoupage sheet. Also layered three talk bubbles for more dimension. Other supplies used: Spellbinders Floral Ovals die, Prima flowers with tiny Hero Arts pearls in the centers. Leaves and talk bubble were cut out with my Silhouette Cameo. Designer papers are Bazzill Basic Red. A super card Deloris, such a fabulous image and lovely red and white papers. Super duper cute,love the gingham papers. So this was on a disc? Very cool indeed! Adorable- Love your die-cut and flowers. Thanks for sharing with us at CCC Digi Creations. Love your card. It will make anyone's "special someone" truly happy.